I came across ‘Siblings’ a linky on Along Came Cherry. 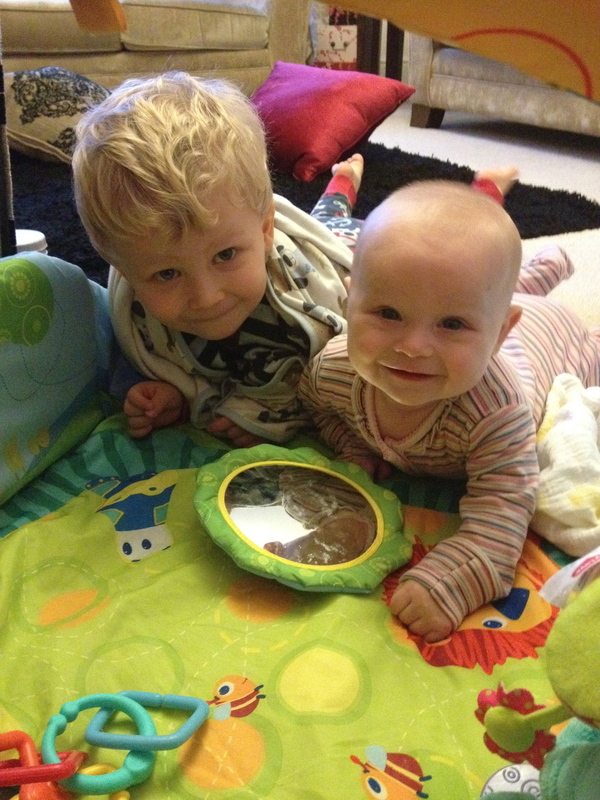 Jess inspired me to join in and once a month capture my two little bambinos together. What a fabulous idea. She co-host the linky each month on the 10th with nine other bloggers. It’s not an easy task to get pictures of my two together, I will admit as Buba hates the camera. So to stage gorgeous settings, and activities for them to do together and capture it is a challenge. But I love a good challenge so I will join the rest of the hosts and link up each month hoping to capture some awesome sibling moments. This month my “Sibling” pictures are a little grainy and the lighting is horrible because the moment was there and I had to capture it with my iphone before it disappeared, as we all know they don’t come too often. I am blessed that my two get along great so far, I fear this stage won’t last long so I am soaking it up as much as possible. 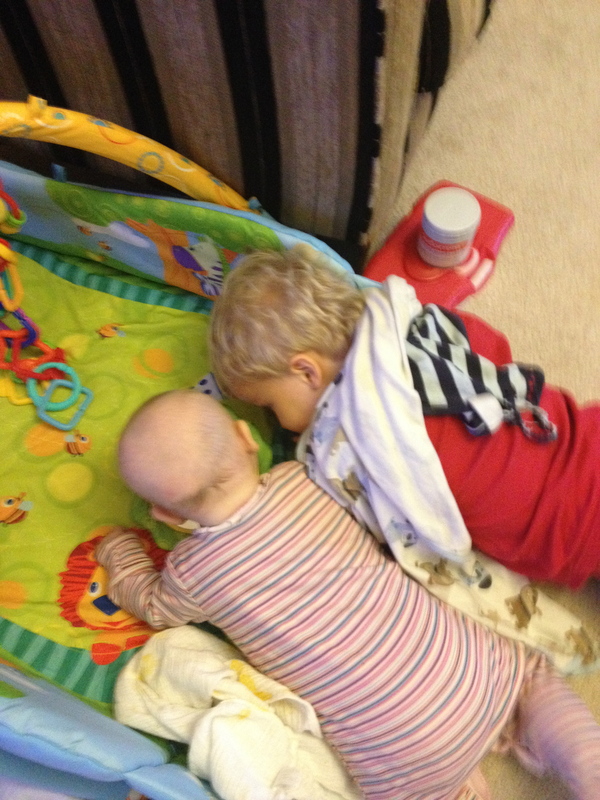 I think they were plotting against Mommy and Daddy in hushed voices. Buba was attempting to teach Missy Moo what the mirror is for, I think I can foresee bathroom fights over the mirror already. “Look here, Missy Moo, that’s you.” Buba said. 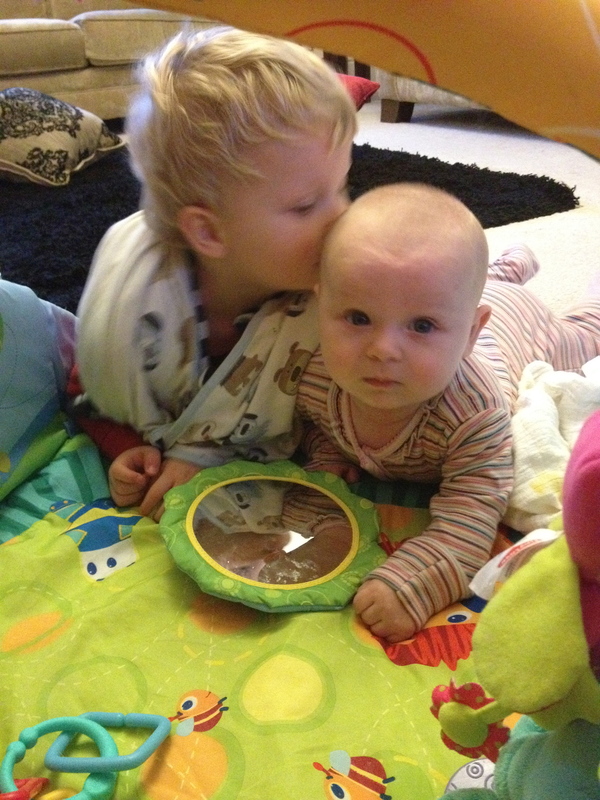 I asked him if he loved his sister, his reply, “My Missy Moo!” and showered her with kisses. Enough said. Ya I love how much more they interact now. It’s so cute. Wish I could have more siblings for them!!! Such a sweet set of photos. Totally adorable. What a cute little moment captured. It’s so true that you just have to grab a camera when these moments happen because it’s just too cute not too. Thanks. I think it’s good when they don’t fret over new baby in the house. I have friends that struggle with that. We r blessed. Love ur linky. Thank you!!! It’s hard to contain. it grows straight up and gets really afro type if I don’t keep it short. Not sure what his sisters will be like yet. Aww they are very cute together. Thank you! And thanks for stopping by from the linky and commenting. I have come across your blog before this linky and I really enjoy reading it. Your title cracks me up it is so me….flabby tummy tucked into my dresses and heels. lol hahaha love your sibling post as well. THank you for commenting, and stopping by. Hope to see more of you here. Off to check out your blog. Hopping over from the #siblings linky. Agreed….it’s a fabulous linky. So many beauties to cherish and love. I hope you are so right. I had a protective big brother and it was the best. Thanks for commenting and stopping by. Love PoCoLo too. Off to check out your blog. Definitely join in…. it’s a great linky. I struggle to get happy posy pictures of both. Half of them will be one of them blurred because they never stop moving. Oh they’re so cute together! 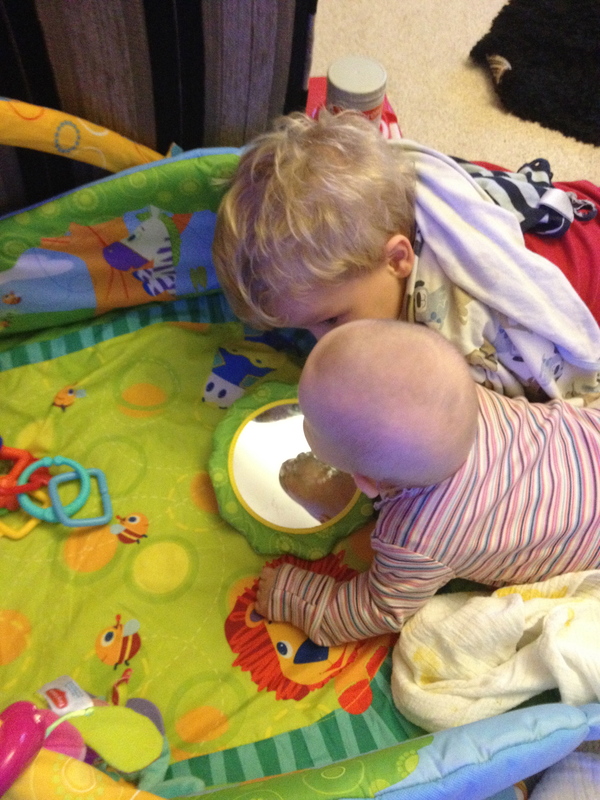 I love it when you find them playing nicely together when you were least expecting it! Yes I was just relieved the blankets weren’t over her face or she wasn’t cover with all the toys in the toys box…which has happened before. hahahaha Sibling love is a sweet thing. Super cute photos! I can’t wait until we have two! Yes it’s definitely more fun having two as watching them bond and grow together. Love it. Thanks for the PoCoLo love. I know it’s one of my favorite. I love photography I only wish I was better at it. These are poorly taken and excuse the muslin that’s missy moo had vomited mangoes all over right before picture. Hahaha but they moment was too rare and cute I can to capture it. Bad lighting dirty rags and all. I love seeing siblings try to help out with the littler ones. It’s so protective and caring!!! If I could have more kids I would!!!! Siblings are the best. Aww, how sweet that he wants to take care of her – it’s lovely to watch that caring side develop. And definitely embrace the iphone shots!! The best memories are the ones on my iphone because it’s always easier/quicker to get a photo that way. Yes they adore each other so much. She never takes her eyes off him either. Too cute. Only wish the lighting in my house was better. I have always loved photography but my pictures never turn out spectacular. Shame. Thanks for commenting and stopping by. What lovely photos. It’s lovely to see how their relationship grows isn’t it. My son is very protective of his little sister and I am hoping it continues. Thank you so much for the PoCoLo love and stopping by. It was a moment I couldn’t let go by … bad lighting and all. lol They are getting really close and I love watching them bond. Thank you!! I know I was so worried Buba was going to cover his face when he saw my phone so I had to pretend I was texting and not taking a pic. He hates the camera unfortunately. Boo. Thank you they really do get along so well so far. I am lucky. Hoping more of these moments to come!!! I have six old brothers and it was always like this times 3 but I knew I had to has at least two kids so they could experience sibling love. I only hope it always stays like this. Such cute shots! Most of my great moments are captured in blurry cell phone pics too. Thank you. It definitely is one of my favorites.